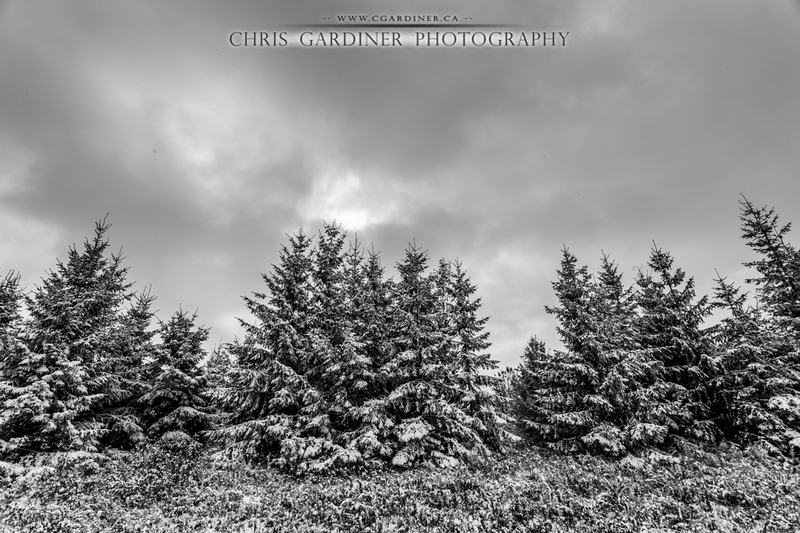 A snap from out on a morning drive after our first snowfall overnight. Middle of October for a fresh snowfall that 'sticks' is something I grew to expect while living in the mountains, but now that I live in the relative flatlands of Ontario, I wasn't quite expecting it. We woke up on the Saturday to a little dusting of snow in the shady corners of our yard and thought "aww thats so cute, a little bit of snow this morning - now let's go on the sightseeing trip we planned" so we did. About half hour into the trip that little dusting got deeper. 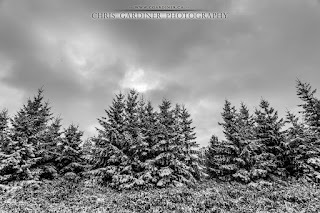 This was a photo shot from the passenger side of our vehicle at some nicely coated evergreens we were passing, and is officially one of the first few snow photos for this winter. There's already been a whole heap captured in the 36 hours following this, but I don't want to shock anyone with too many cold weather photos and send them into hypothermia. This is a full colour image, but could very easily pass for a monochrome don't you think?